Despite my attempts to develop sophisticated palettes around here, the vote for this here classic as a favorite is clear; Cheese bread. So delicious it’s not fair. The white flour, the airy fluffy texture, and well… the cheese, all make for quite seriously the most amazing grilled cheese sandwich, egg in a basket, or midnight snack imaginable. This loaf is quite simple, you can use what you have, and surely you won’t be disappointed. Dissolve 2.5 tsp. of yeast with 1 tbsp. of sugar in 1.4 cup of warm water. Proof. Mix flour with salt in a separate bowl. Making a well in the center mix in 1.5 cups of warm water, 1/4 cup of softened butter, 1 tsp. of tabasco and the yeast mixture. Stir with wooden spoon into it is amalgamated. Amalgamated? Yes. Amalgamated. Mr. Beard improves my vocabulary. Knead for 10-12 minutes adding in flour as needed. 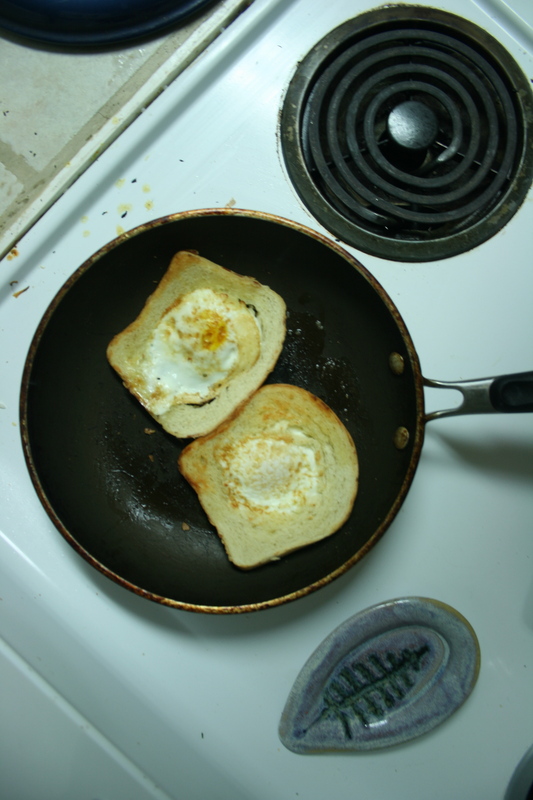 Turn into a buttered bowl and let rise for about 2 hours until doubled in size. Punch down and knead 1/4 parm and 3/4 cup of swiss or Gruyère. I had neither, so I used a full cup of Monterrey jack. Cut the dough in half and let rest for ten minutes. 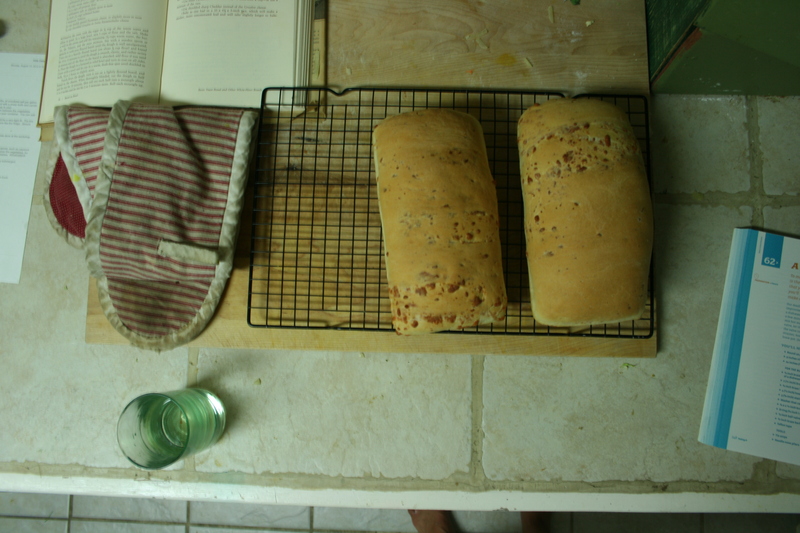 Roll each half into a rectangle and then into a loaf pinching and tucking the sides as you go. Place into a well buttered bread pan. Let rise once again until the loaf has come to about an inch over the top of the pan. Bake in a 375 degree oven for thirty minutes until it sounds quite hollow. It is nice to take them out of the pans and let them crisp up for the last few minutes in the oven. This crust turns out to be a very soft one regardless. Butter up, toast, or grill, this one is a winner. This entry was posted in the year of bread and tagged cheese bread, egg in a basket, James Beard, recipes. Bookmark the permalink.